Set at the foot of the south-facing slope of Slievemore mountain, this 'village' consists of the remains of almost 100 traditional stone cottages. They are set either side of an ancient pathway, almost all aligned in the same north-south direction, and they occupy one of the most sheltered areas of Achill Island. The 'village' - literally it is three distinct groups of cottages - extends for a distance of about one mile. It is thought that the village was occupied during several different stages in history, with some of the buildings perhaps being constructed on top of previous dwellings. Through study of the field systems surrounding the Deserted Village, archaeological investigation, and historical research it has been established that settlement dates at least to the Anglo-Norman period (12th Century AD). The presence of a megalithic tomb close to the village, dating from the 3rd or 4th Century BC, indicates habitation in the area some 5000 years ago. The most recent period of habitation came to an end in the early 20th century, when the cottages were used for 'booleying' by the local population. As 'booley' houses they were occupied during the summer months, when cattle would be grazed on the mountainside, but the residents would return to their homes in the villages of Pollagh and Dooagh for the winter months. 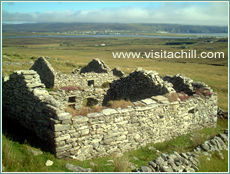 Achill is thought to be one of the last places in Europe to have practised this type of settlement. There are a number of other booley villages on the island, including one at Bunowna (in the valley at Keem Bay) and another at Annagh, but Slievemore is by far the largest and best preserved. An annual Summer Archaeological School is held at the Deserted Village at Slievemore and it is hoped that this research will offer further insight into the history of the area. For visitors to Achill though, the abandoned stone cottages and surrounding fields - with potato ridges still clearly visible under the top layer of grass - provides a fascinating flavour of how life was lived in former times.